Cambrian sandstone exposures at Timna Park, southern Israel. 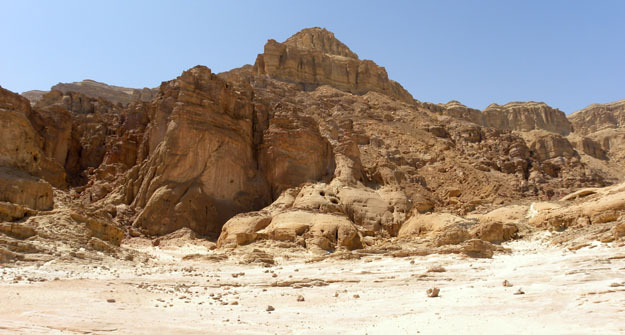 MITZPE RAMON, ISRAEL — Our last stop on our shabbat trip today was at Timna Park north of Eilat, Israel. Here we saw a combination of geology and archaeology. The porous sandstones exposed in the cliffs have been mineralized along fault and joint planes by a green copper ore. The world’s oldest underground copper mines, dating back 6000 years, are here, along with hundreds of more “modern” mines hand-dug by Egyptians between the 14th and 12th centuries BCE. The sandstone itself is rich with geological information, including cross-bedding, channels, and a very prominent honeycomb weathering. 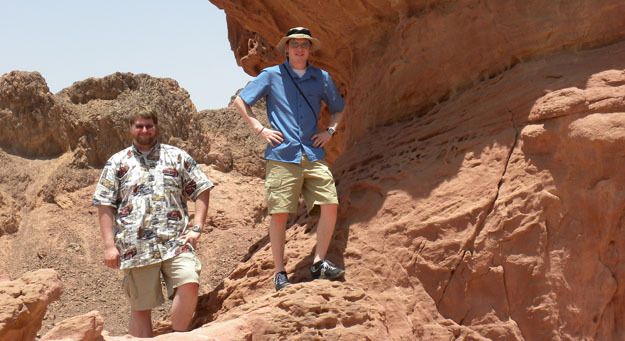 Micah Risacher and Andrew Retzler at Timna Park. Micah and Andrew are well protected in this complicated part of the world! No worries. Blogger’s note: We have only limited internet access on this trip, so we may not be answering our personal email very often. I send these posts in pre-written bursts when we get some internet time. MITZPE RAMON, ISRAEL — Wooster geologists this summer have been working hard with boundaries of the geological kind: horizontal surfaces in rock sequences that mark dramatic events in Earth history. Our favorite has been the Cretaceous-Tertiary boundary, but we are also concerned with the boundaries between rock units such as formations and members. In fact, we only know where we are in the geological record when we find a boundary and position ourselves above or below it. Today we met a different kind of boundary, one as dramatic as we’ve seen in rock in its own way. 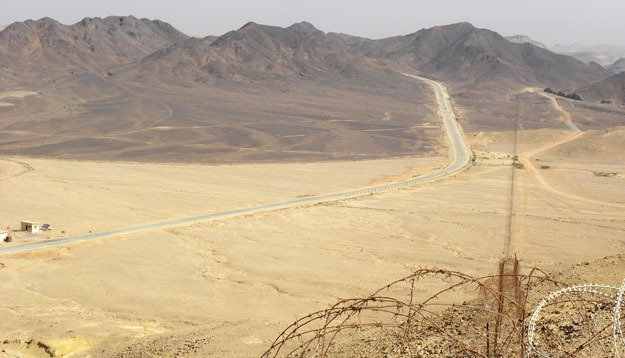 Pictured below is the Israel-Egypt border north of the Israeli city of Eilat. It certainly gives us direct information on our position in the political world. The border between Egypt (on the left) and Israel (on the right) looking north from just north of Eilat, Israel. 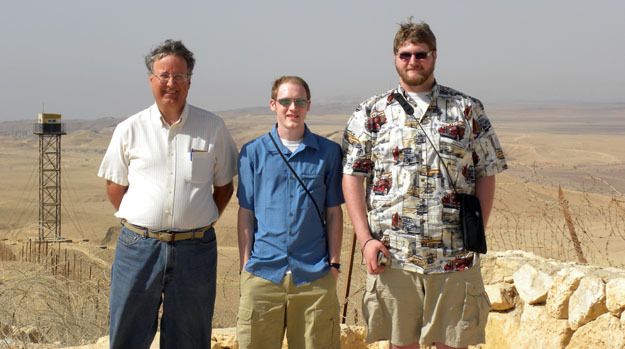 Our field group at the Egypt-Israel border, with an Egyptian border post in the background. 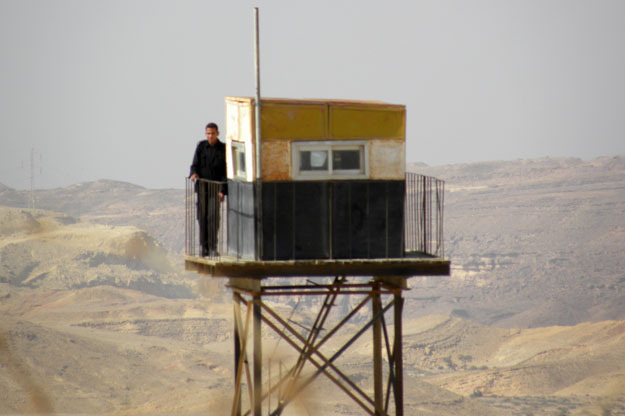 A very lonely (and friendly) Egyptian border guard. MITZPE RAMON, ISRAEL — Every shabbat in Israel (Friday sundown to Saturday sundown) we cease geological work and take a break. Our first shabbat on this trip started with a wonderful dinner at the home of our hosts Yoav and Noa Avni, and then on Saturday morning we drove to the city of Eilat on the Red Sea coast which touches the southern tip of Israel. Our goal was to visit the Underwater Observatory Marine Park to see the modern equivalents of our fossil animals and sediments. 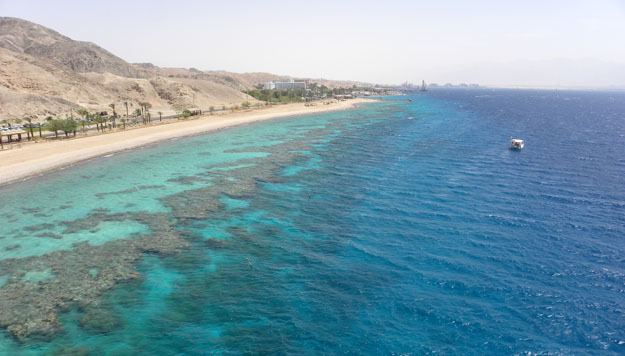 Shoreline of Eilat, Israel, from the Underwater Observatory tower. A fringing reef can be seen just offshore. We saw plenty of sharks in a large glass-walled tank, and then countless examples of marine life in aquaria and through the windows of a glass-and-steel structure planted about thirty feet down into a living coral reef. It all helps give us context for our reconstructions of Cretaceous marine ecology, and we also had much fun studying the fascinating and beautiful living animals before us. 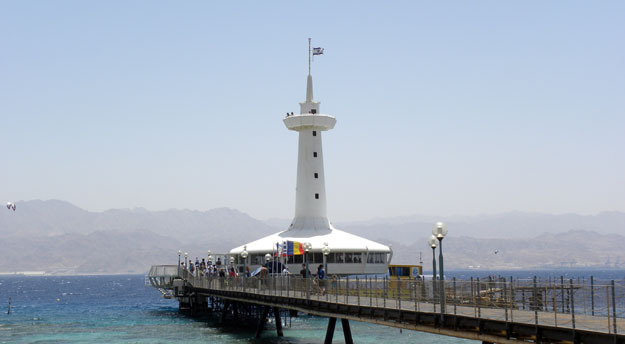 Top section of the Underwater Observatory in Eilat.